ScreenFlow 4.0.2 is capable of recording, editing as well as sharing your video with the world. Some of the amazing features in this software make it easy and fun to work with. This software is designed for capturing screen on your Mac. You can record your screen, capture input from your video camera, microphone or computer audio all at the same time. So, if you do a number of tutorial videos or upload videos to YouTube more often, this software will make your work much easier. 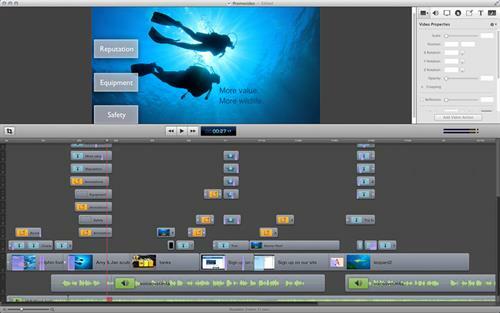 The user interface of the software is pretty easy and more or less like the iMovie for Mac. So, if you're familiar with iMovie you can work with this software with ease. It can also record videos from USB camera. After you finish your recording of the screen, the editor window pops up and you can edit your video the way you like. There are options to change speed, crop the video, rotate and much more. There are many great features available in this software. Let's take a look at them. There is a lot of scope for editing in the software. Let's first have a look at what are the new features added in the latest version of the software 4.0.2. With nested clip feature you can merge multiple elements i.e. videos, texts, images into your timeline and even edit it in a separate tabbed timeline whenever you want. In this latest version of ScreenFlow you can export your finished videos to MPEG-4 format with x264 codec. This new version has added a new feature that is adding captions to your videos. Now-a-days we see a lot of videos on YouTube have captions to give instructions to the viewers about the video. With ScreenFlow you can add captions to your videos. You can create captions in different languages. You can even export them in separate SRT files. Today, a lot of editors are making use of the chroma key technology. With the chroma key technology you can replace a color (most probably green or blue) with any image or video that you like. So, you can make someone fly like a superman or even make videos like you're standing at the top of a high building just by replacing the green screen that is behind the person to some other video. So, this will be a pretty cool feature. With recording timer you can set the timer for your screen recording and the recording stops right after the time limit and enters the editor window. This can be really useful if you're recording videos strictly for a particular time period. Just set the timer and start your recording, and it will stop right at the time that you set. You can fill the existing gap on the timeline by just pasting a new element like text, annotation clip or any media in it. Save Frame enables you to save any frame in your timeline as a PNG image in the new version of the software. It can be very useful sometimes. You can best edit your videos with the feature of multi-layer track editing where you can create a different track for each of your elements. You can also give different effects to the different tracks. It makes your editing much simpler. You can also do various other tasks like tracking your mouse cursor, add mouse click effects, and adjust the mouse pointer size. You can also display which keys are pressed on your keyboard, which is very useful for some educational video tutorials. With callouts you can do several important tasks like focusing on the mouse pointer. You can also blur out sensitive data on your screen by using this feature. You can create amazing titling effects in this software. You can include multiple fonts and styles in your titling to make it more interesting for the viewers. This is an amazing feature in this software. Using this feature you can draw shapes like circles, lines, squares on your video. The annotations are saved to a different track. You can then edit and give different effects to the annotations. Transitions play a very important role in video editing. There are over 15 2D and 3D transitions available which you can insert before, in between or after your videos. You can directly publish your finished video to YouTube or Vimeo by using the Publish button in this software. The ScreenFlow 4.0.2 is a great tool for recording your screen as well as editing your video. The new version has got several new features which enhance the video editing experience. If you experience any trouble using the software you can use the help option in it to know how to use a particular feature in the software. You can also get support from the website by sending them an email or using telephone. You can export your videos in different formats like MPEG-4, WMV and MOV. You can also use the Publish to Flash option where you will get an HTML option for website use. But the software does not export to AVI or WAV which are very popular media formats. The ScreenFlow costs $99.00 and is worth its price with all the exciting features that it has. So, if you are a Mac user and also a person who does a lot of video tutorials or professional educational training, then this software is a perfect one for you which will satisfy all your needs.